The WED2B 2018 Wedding Survey: All the latest wedding trends revealed! 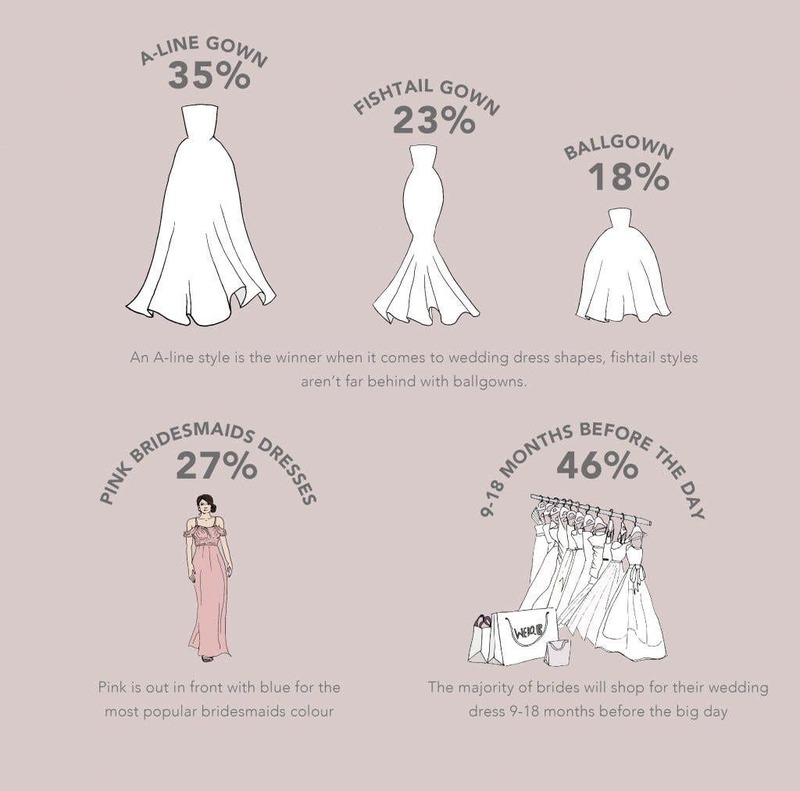 Our survey reveals that most brides are happy to wait for that walk down the aisle. The majority are engaged for between one and two years, so there's enough time to get the details just right or to save up to cover the costs of the wedding. 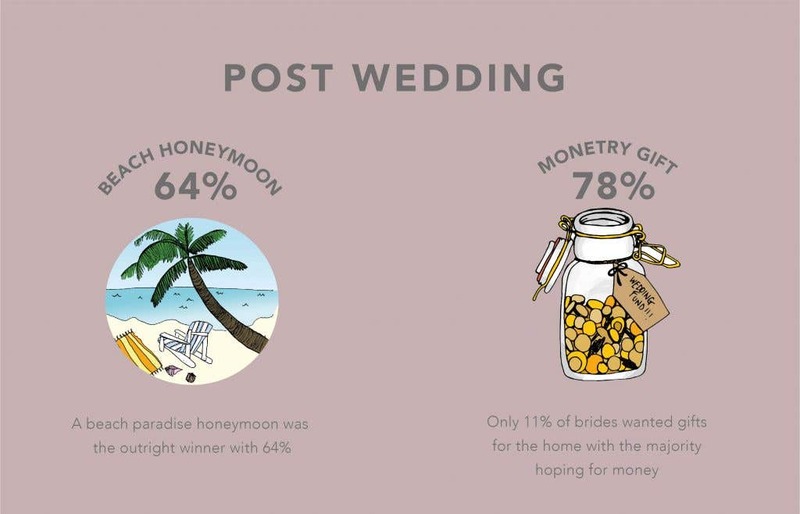 And, when it comes to money, modern brides know how to manage their budgets. 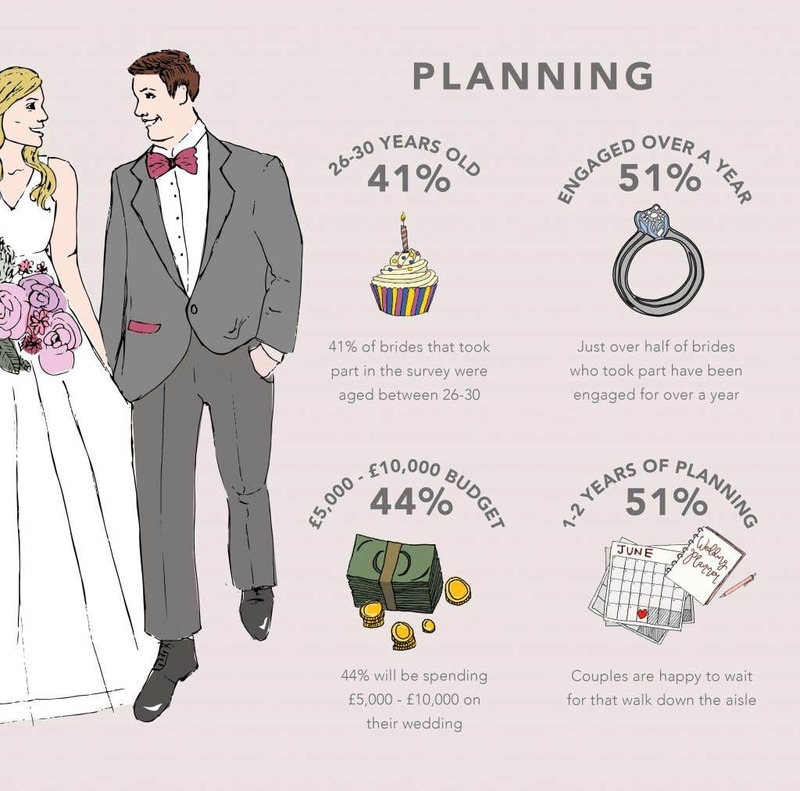 The average couple will be spending between £5,000 and £10,000 on their big day. Today’s couples are more traditional than you might expect too. Most prefered enduring favourites, such as champagne drinks receptions, sit-down meals and iced wedding cakes, to trendier alternatives, such as cocktails, food stalls or 'naked' cakes. Rustic was the most popular theme, with 36% of brides decorating their venue in this relaxed, low-key look. The American trend of a rehearsal dinner the night before doesn't seem to be catching on either. 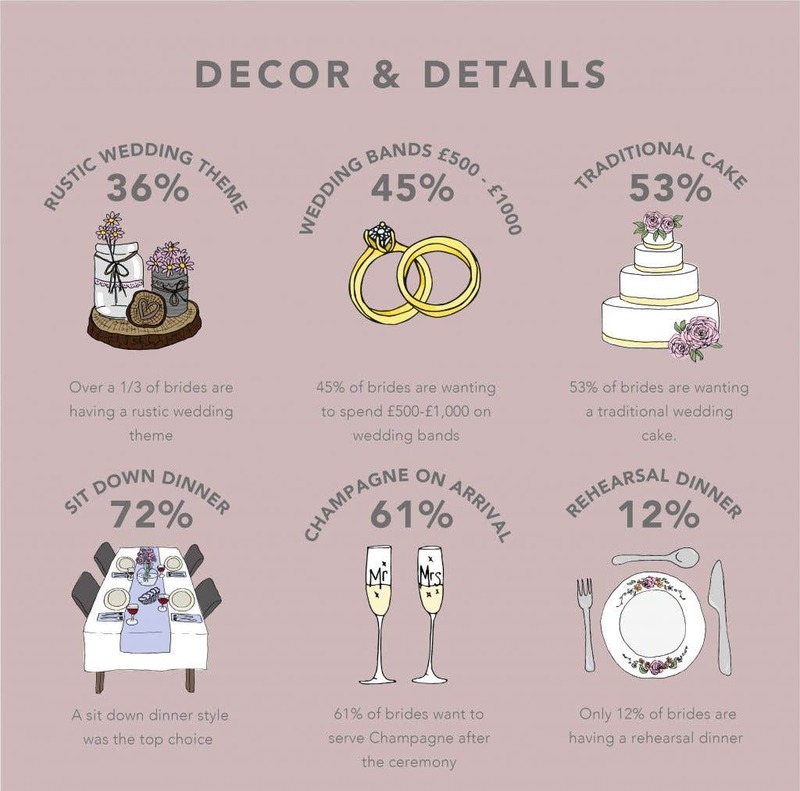 Only 12% of brides plan to make one part of their celebrations. Meghan Markle's stunning dress started a new trend for understated, minimalist chic, following last May's royal wedding. Despite this, when it comes to wedding dresses, the universally flattering A-line silhouette is still the big winner. This is closely followed by a fabulous, curve-enhancing fishtail, which is generally purchased between nine and 18 months before the big day. 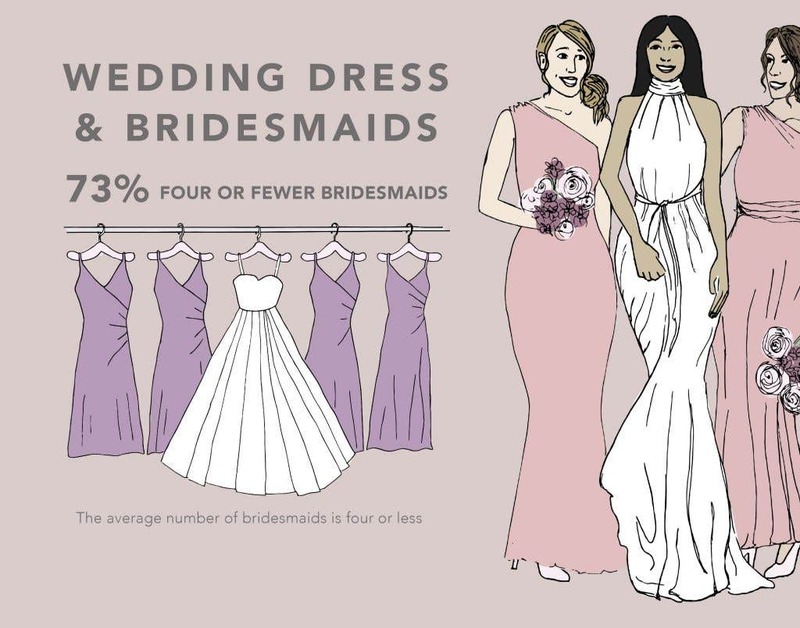 When putting together their wedding party, most brides go for a maximum of four bridesmaids and dress them in pink, which was top of the list when it came to dress colours. Although blue was the second favourite, with 23% of brides choosing this attractive, summery shade. Want to know where your colour choice comes on the list? Check out the full results here! Pick the right colours and styles of bridesmaids dresses for your girls. And what does the modern bride accessorise her dress with? A classic hand-tied bouquet of course! 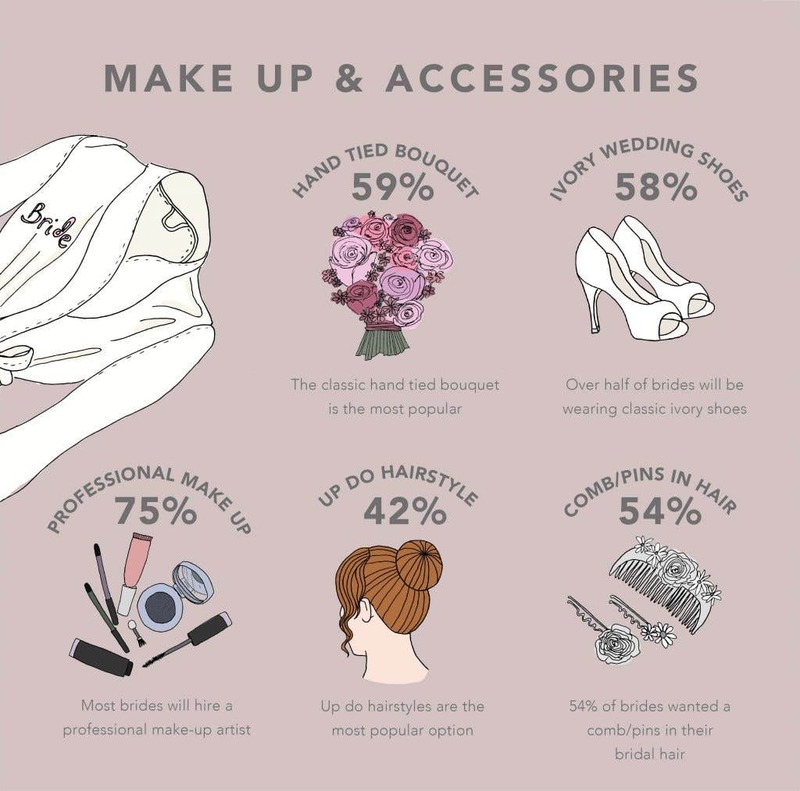 59% brides choose to carry one down the aisle (while wearing sophisticated ivory shoes and styling their hair in chic up-do!). Find the perfect bridal accessory for your bridal look. Modern brides really are spoilt for choice when it comes to where they say, ‘I do’. 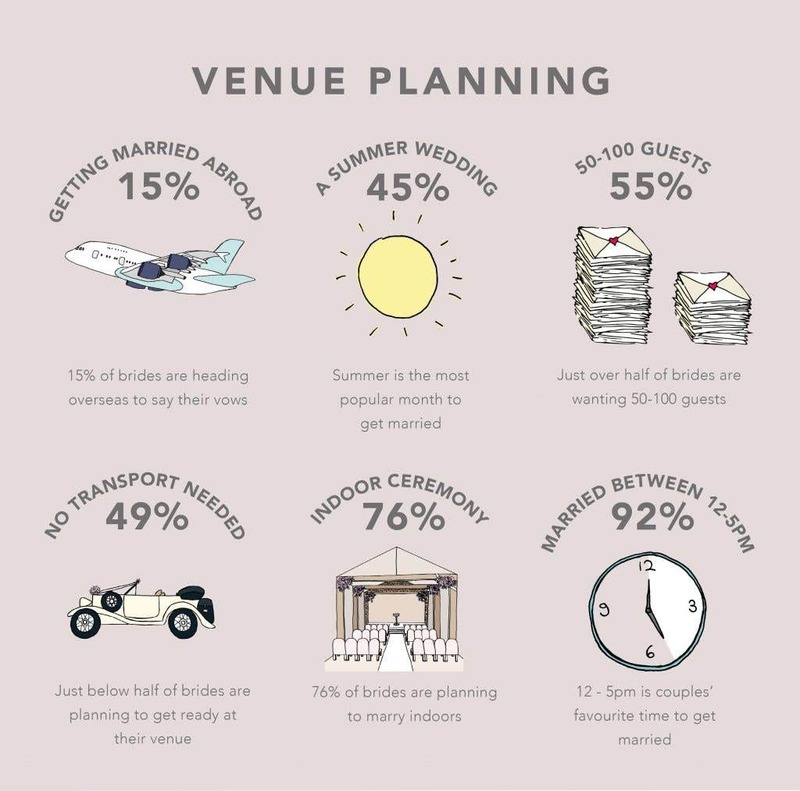 Hotels, country houses and barn venues were all popular, but hotels proved to be the favourite for 29% of brides. The ‘Other’ category also included interesting settings such as restaurants, beaches, churches, golf courses and registry offices. A three-course meal and a slice of cake isn’t always enough for contemporary couples either. Plenty now choose to add extra elements to make sure guests have a great time. 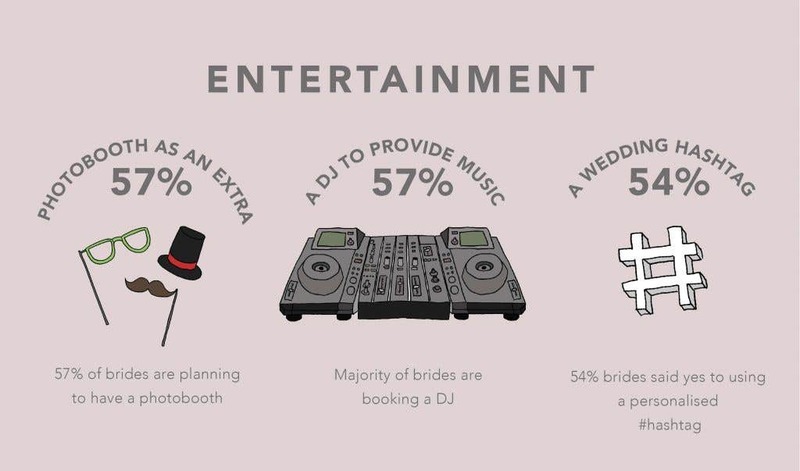 For example, 57% of our brides are planning to have a photo booth to keep people entertained. While 57% will also be hiring a DJ to pack out the dance floor. And just over half of the brides who completed our survey will be having a wedding hashtag too, to encourage guests to share the love! Modern couples aren’t afraid to ask for exactly what they want these days. Forget toasters, instead of asking for gifts 78% are happy to ask for cash to put towards something really special. Then, when it’s all over, most of our newlyweds want to relax in a beachfront paradise, enjoying the honeymoon of a lifetime. View the full 2018 Wedding Survey! So, if hearing about other brides' wedding trends have made you feel inspired, we can help! Alongside our range of stunning dresses and accessories, our Wedding Suppliers Directory showcases the finest wedding suppliers in the industry. There's everything from transport, photographers and florists to cake makers and entertainers. It's an essential collection of quality local suppliers who can help you bring your vision to life. Enjoy! Want to know more? Click here to read the full WED2B 2018 Wedding Survey. Our 2019 wedding trends survey, which will also cover Europe, will be sent out to brides in Summer 2019. If you'd like to take part please follow us on Instagram, Facebook or Twitter and keep an eye out for more details.